This interactive presentation contains the latest gas (and a little oil) production data from all 8862 horizontal wells in Pennsylvania and Ohio since 2010, through March. Data for West Virginia is also included, but deselected in most views, as it contains only data through Dec 2016 (use the “Basin” selection to include this state). The region posted another quarter with year-on-year growth, as total gas production rose above 18 Bcf/d, setting a new record. New completions have recently been at the lowest level in more than 5 years however, although drilling seems to have picked up again compared with the low point in the first half of 2016 (see the spud/first flow statuses in the “Well status” tab). 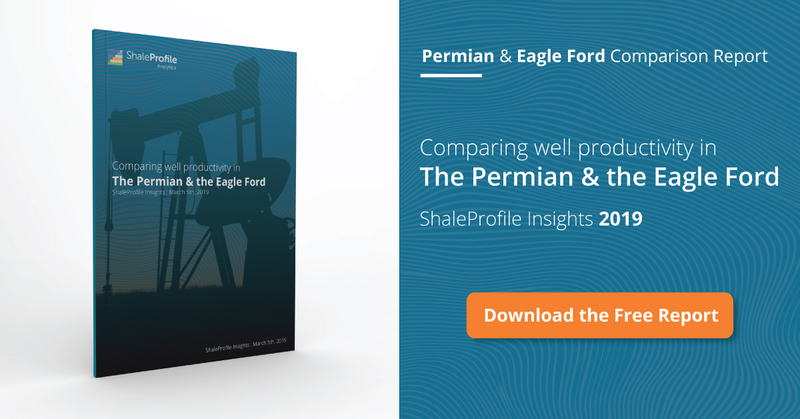 As the production rate profiles show in the “Well quality” tab, where wells are grouped by the quarter in which they started, there have again been significant gains in early production. Chesapeake is with about 3 Bcf/d operated production capacity the clear leader in this area, although Cabot, is narrowing the gap (see the “Top operators” tab). The latter has all its production in the highly prolific Susquehanna county in northeast Pennsylvania. This gives another view on how initial gas production rates have moved higher over the last year. If you use the operator selection at the bottom of the view to only select Cabot, you’ll see that its production profiles are quite a bit better than average. Actually, as the 4th tab shows (“Productivity ranking”), this operator has the best performing wells, as measured by the average cumulative gas production after 2 years on production. At 4.7 Bcf, this is double the production compared to the average output of wells operated by Chesapeake. Next week I plan to have a post on the Niobrara region again. Just read the detailed numbers in the Iran-Total-CNPC deal on South Pars 11 project. It will cost them $4.8 billion over 20 years to reach a production capacity of 51million cubic meter per day. The cost obviously does not include LNG conversion because it reads “gas will be pumped into Iran’s national gas grid”, not LNG. The Marcellus has 8,862 wells with a output capacity of 18BCF, or 600million cubic meters per day capacity, and costs is estimated to be $55~80 billion (each well costs $6~9million). So, the cost to reach peak production per cubic meter are about the same, only that shale gas production goes down much faster from its peak production. Based on the Marcellus production data here, we see that Marcellus has about twice to three times faster for the first 3 years decline and then level off to similar or even slower decline when compared to the conventional wells, so the cost of one of the lowest conventional natural gas field is close to 1/2 to 1/3 of the best shale gas field here in North America. The latest cost for the 30million cubic meter per day Fuling shale field in China only requires drilling 330 wells with each well costs RMB60 million after average. That’s RMB200Billion, or US$2.8 Billion. The output of the Fuling field is down scaled to about 1/3 to 1/4 of the maximum allowed IP, and so its output decline is expected to be almost the same or even better than conventional gas field. For example, the first discovery well has been producing at constant 2MMCF for over 4 years now with total production over 2.8BCF (90million cubic meters), with no decline at all. The EUR of the 330 wells are estimated to be over 6BCF each, total over 2TCF. That’s an excellent comparison amongst the three areas. The South Pars/North Dome field should be in a class of its own both for size and economics for decades to come. Unfortunately, as the daily headlines indicate, more is at stake than geology and operations. The Fuling play is interesting for so many reasons. As the operators continue to surmount operational and logistical hurdles, the output should not only continue to grow, but ‘lessons learned’ should enable unconventional development to expand to other areas in China. The Marcellus is on the cusp of huge growth the next 18/24 months as the Rover, Leach Xpress, and Mariner East 2 come online in the next few months. All three are currently under construction. The ME2, in particular, should have a big impact as the takeaway to Marcus Hook will increase from 70,000 bpd NGLs to about 300,000 bpd. A second, additional line – dubbed Mariner East 2X – is being emplaced sequentially so eventual capacity will exceed half million barrels per day liquids. An astonishing figure. If you have not been keeping track, the propane/ethane/butane ‘story’ is one of the bigger, under the radar happenings these past two years. In the US alone, almost $200 billion is being spent to build or upgrade petrochemical plants. Petchem companies worldwide are building, from scratch, large ocean going fleets to transport American (shale) liquids to supply their plants with inexpensive feedstock. Reliance Industries now has a 6 ship, new build fleet of 90,000 cubic meters each, to ferry liquid ethane in a virtual pipeline to their new cracker in India. One bit of a heads up regarding Marcellus well profiles … anything pre 2014 or, definitely, pre 2012, may not reflect future production for a whole host of reasons. Final note, the stepping out of the Utica continues accross the North central tier of Pennsylvania. Tioga and Potter counties have new, successful wells at 10,000’/12,000′ depths where there was little or no production previously. yes, shale gas shall rise! The cost structure for many of the Russia’s conventional gas field is even worse than Appalachia or Fuling in China. China just announce the latest estimate of reserve in Fuling alone is over 15TCF(500Billion cubic meters), second only to Appalachia in the world. China is trying to renegotiate a 20 year contact signed just 3 years ago for pipeline natural gas from Russia starting delivery in 2018, the price is about $10/MCF. The Russia sincerely plea higher price claiming $10/MCF is already losing money there. Now, many EU countries are signing up with Chenerie’s LNG, so does China and many Asia countries. Exactly so concerning the negotiated price of LNG and piped natgas. This is what is becoming so disruptive on a global scale that many people do not yet seem to recognize. The Aussies might be screwed big-time both on the east and west coasts. The Japanese, Chinese, and Koreans are locked in to overpaying – compared to spot – LNG for long-term and they’re trying to renegotiate. Meantime, both Iran and Qatar may have the most abundant, least expensive LNG to greatly (in Qatar’s case) expand into the market. Associated gas from Oklahoma and Texas will continue to be produced if WTI warrants it feasible. And, further muddying the situation, is the stupendous amount of NGLs emanating from the shales. A local Wisconsin politician just said a second large international manufacturer may relocate to his state (in addition to the expected Foxconn) due to low feedstock prices coupled with !ow, methane fueled electricity rates.